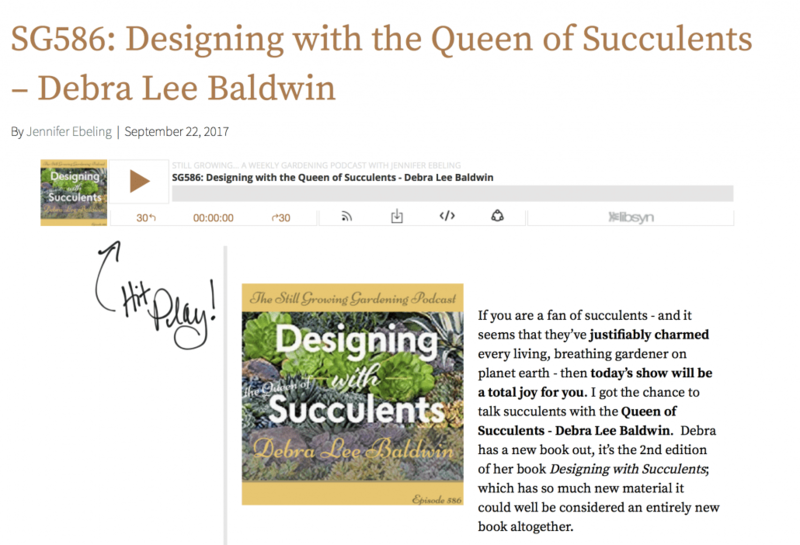 Here you'll find excerpts and links to a few of many media articles and interviews in which Debra Lee Baldwin is featured and quoted as an expert on succulents and their design uses. Included are book reviews, radio, podcasts, TV news, Wall St. Journal, Washington Post, KPBS, and more. Listen to Debra’s KPBS Midday Edition interview about trends in succulent design, waterwise gardening, and using succulents as a wildfire barrier. Watch Debra’s KUSI-TV Good Morning San Diego interview about how to grow and use succulents. Above are selected excerpts. See the full article. Enjoy an in-depth podcast interview with Debra by Jennifer Ebeling of Still Growing. We suggest a long walk and ear buds—it’s 142 minutes! Garden Design magazine honored Debra as their Spring, 2016 "Groundbreaker." "Debra's passion and expertise are unsurpassed in the world of succulents. She demystifies these plants so you can grow, collect and create with confidence. I recommend Designing with Succulents to all of my followers and colleagues. It's my go-to resource for inspiration and information. Everything you need to know about succulent design and care is covered, whether you're a hobbyist or a professional designer."